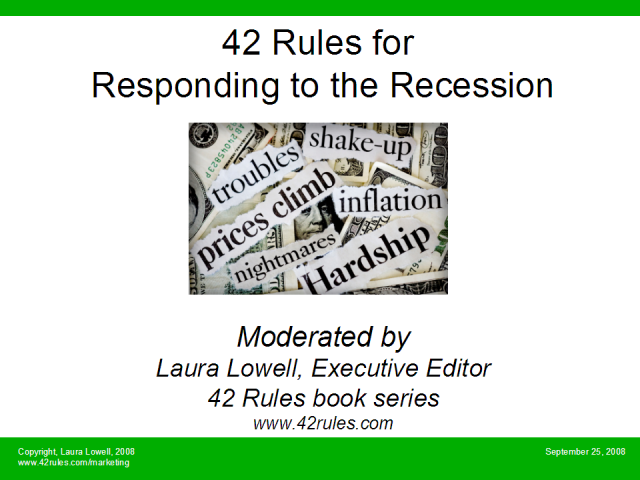 This unique webcast features a panel of 3 authors with a unique perspective on the current economic climate and ways for individuals and businesses to turn things around and use the situation to their advantage. Chris Muccio, author of 42 Rules to 24 Hour Success on LinkedIn, will address the power of networking in these difficult times. Leon Shirman, author of 42 Rules of Sensible Investing, will focus on practical ways to manage your investments in this environment. Mari Anne Vanella-Wright, author of 42 Rules of Cold Calling Executives (Winner of the Silver Medal in the 2008 Sales Book Awards) will share her unique approach to sales.